After Iraqi Kurdish Independence Vote Backfires, 'I Do Not Regret It,' Says Barzani : Parallels In his first interview since pushing through an independence referendum that resulted in an Iraqi military attack, Iraqi Kurdish leader Masoud Barzani tells NPR he's still "very proud" of the result. 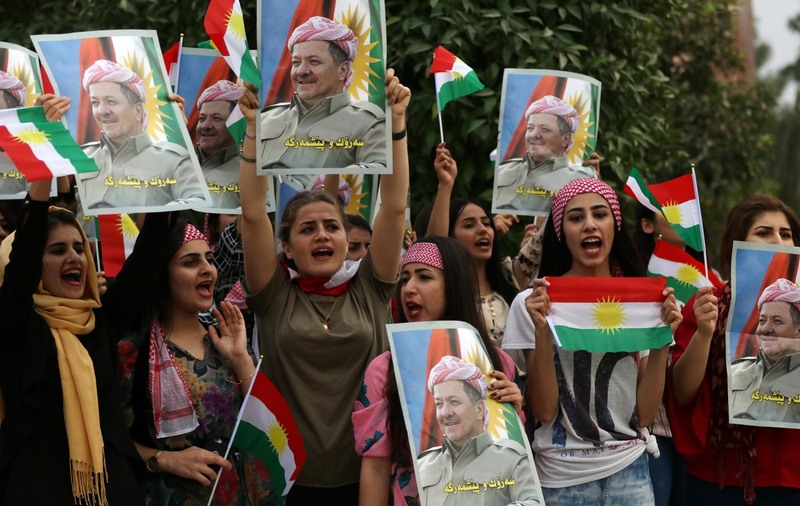 Masoud Barzani stepped down last week as president of Iraq's Kurdistan regional government. The independence referendum he pushed through resulted in a military attack by Iraqi forces. But, he tells NPR, "I am very proud that we have given the opportunity for the Kurdish people to express their vote." He says the region will reassess its relationship with the U.S. The Kurdistan region Barzani was instrumental in carving out from the ruins of Saddam Hussein's Iraq has been turned upside down. Barzani, 71, pushed through a historic referendum for Kurdish independence in September. But it backfired, and instead of the repercussions he expected — economic sanctions and temporary border closures — the Iraqi government sent in troops. Iraqi forces, including Iranian-backed Shiite paramilitaries, took back the city of Kirkuk, oil fields and towns and cities in a large swath of northern Iraq. Federal troops are retaking borders with Iran, Turkey and Syria that the Kurds have controlled since the 1990s. The Kurds have also lost territory they've held since 2014, when Peshmerga fighters moved in to fight ISIS after entire divisions of the Iraqi army collapsed. It's undeniably a disaster. Barzani, though, seems unchanged. Although no longer president, Barzani remains head of the Kurdistan Democratic Party, the dominant party in the regional government. Crucially, he still leads Peshmerga fighters loyal to his party. And as one of the founders of modern-day Kurdistan, he retains enormous influence in many parts of this tribal region. He walks into an interview with NPR — his first since Kurds went to the polls on September 25 — wearing his usual traditional Kurdish clothing, khaki baggy pants and a tunic with a cummerbund, along with the red and white headdress of his Barzan tribe. He has the bearing of the Kurdish fighter he cherishes as his core identity. 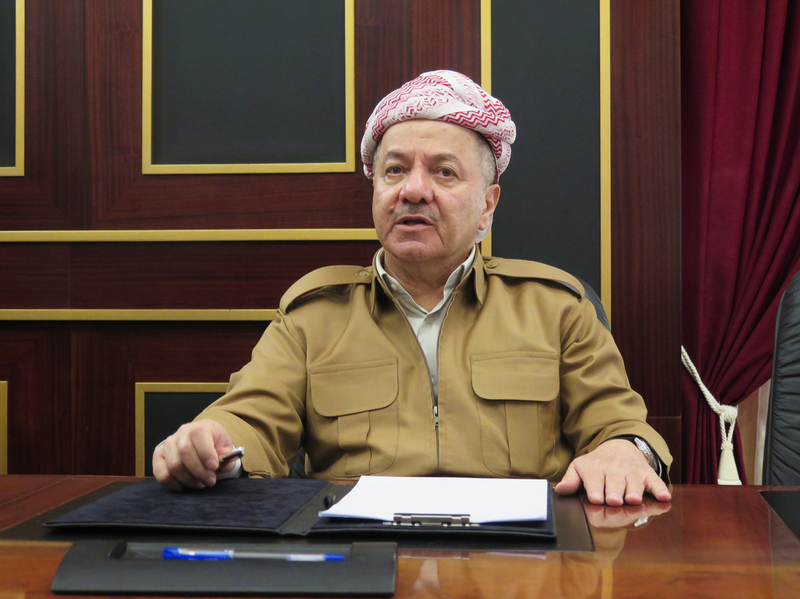 Barzani professes to have no regrets. He says "of course" the consequences his region has suffered were worth it to make clear that Kurds want independence. "I am very proud of the result. I am very proud that we have given the opportunity for the Kurdish people to express their vote – and I do not regret it," he says. Iraqi Kurdish students hold posters of Iraqi Kurdish leader Masoud Barzani during a demonstration in his support in Irbil, Iraqi Kurdistan, on Oct. 30. Asked about the expectation that he take some responsibility for the aftermath, Barzani says it was a collective decision to hold the referendum and not his alone. He accuses specific Kurdish leaders from the rival Patriotic Union of Kurdistan of treason in handing over Kirkuk. And he blames the United States for allowing Iranian-backed Iraqi paramilitaries working with Iraqi troops to attack the Kurds. "They were using American weapons – Abrams tanks and other things the American government gave to the Iraqi government to use in the fight against ISIS. But they used it against the Kurdish people, and the Americans stayed silent," he says. The U.S., the U.K. and almost every other ally had warned Barzani not to hold the referendum in September. U.S. officials brokered a deal with Baghdad to open negotiations with Irbil. If those failed, the U.S. would promise to recognize the need for a referendum. But Kurdish officials say the offer came too late – two days before the vote, when Barzani had already made clear the referendum would go ahead. After Saddam Hussein's genocidal campaign against the Kurds in the 1980s, the United States created the conditions for the Kurdistan region to flourish, leading a no-fly zone in 1991 protecting the Kurds from air strikes. For the first time in Iraq, the Kurds gained control of their borders, creating a region that — while not exactly democratic — was seen as the most stable, prosperous and US-friendly in Iraq. Kurdish leaders had made clear the September vote would not trigger an immediate declaration of independence. Until the last moment – at a press conference the evening before the referendum – Barzani seemed to think the worst repercussions would be border closures or economic sanctions. But with so many fault lines in the Middle East, no country was willing to see the breakup of Iraq. "We were expecting some kind of reaction, but we had not calculated on military attack," Barzani tells NPR. The Kurds and their Peshmerga fighters have been one of the strongest U.S. allies for two decades. US-backed Kurdish forces — often unpaid and under-equipped — played a crucial role in the multinational fight against ISIS. Barzani sees the U.S. willingness to allow Iran-backed Iraqi forces to attack the Kurds as an inexplicable surrender to Iranian influence. "We regard ourselves as friends of the people of the United States, as friends of the government of the United States but ... we have to revise our relationship with those who are responsible for this," he says. "I can say we are going to have a very strong revising of our relationship." He says the Kurdish people see it as betrayal. "From 2003, the people of Kurdistan have received the American people with hearts and flowers," he says. "The love and hope and trust that people had in the United States has declined and is decreasing day by day." Instead of relying on the United States, Barzani says, the Kurds could improve their relationship with Russia. Barzani's nephew Nechirvan is the region's prime minister. He and deputy prime minister Qubad Talabani – another of the new generation of Kurdish political leaders – have been trying to persuade the Iraqi government to sit down to talks. In much of the rest of the country, Iraqi Prime Minister Haider al-Abadi is riding a wave of popularity for regaining Kirkuk. He insists the Kurds have to renounce the referendum – declaring it null and void – before he'll sit down to negotiations to stop further Iraqi military movements. Masoud Barzani says that's impossible. In a concession, the Kurdish government has said it would "freeze" the results of the referendum and put seeking independence on hold. "Who can annul 3 million votes?" asks Barzani. "It's really very meaningless, this insistence. There is no way they can be annulled."